I really enjoy the ultra races that start early which is just as well as the Highland Fling starts at 6am. I was up just before 4am to eat my porridge before leaving home at 4.45am. Katrina & I picked up our good friend Lesley in Houston on the way. We arrived to a packed Tesco car park at 5.30am. Time for a quick photo before Katrina headed home. He plan was to drive to Tyndrum for 11am to be part of the finish team. Lesley and I wandered over to hand in our drop bags, chat to few friends and get ready for the start. I felt quite relaxed and ready to go. This would be my 8th Highland Fling but my first since 2013. The race has grown from 70 in 2007 which was my first year (and the 2nd Fling) to around 800 now but commendably the race as it has grown has not lost that friendly feel. For a few years there was a staggered start with women and over 50’s men starting at 6am and the rest of the field at 7am. John Duncan, the excellent race director, introduced a mass start but with waves going off a few minutes apart. As everyone is chip timed and your time doesn’t start until you pass the mat it works really well. I set off in the 10-12hr wave. I like to have a plan to aim for so I carried splits for a 10:15 finish which was my gold goal. I thought this was going to be challenging but I was looking forward to seeing how my training has been going. In 2013 I ran 10:05 so it would be interesting to see how much I have lost in 4 years! My main focus though was not going to be my split times but my heart rate. Over the last few years I have found this to really help me. My main aim now is to try and finish well and to do that I need to start sensibly. Running to a set heart rate helps me to achieve that but it does take a lot of discipline especially early on when I’m feeling fresh and could run faster. My target heart rate for this race was 135 which from past races of a similar length was about right. Once we were through the town centre I was running with Stephen Magee. We were chatting away as the early miles ticked by. What I didn’t realise was that Stephen and I would see a lot of each other over the next hours and we ended up finishing within a few minutes of each other. I did have splits for all my mini-sections but I was only going to look at them after I had gone through the marker and only as a guide to how I was doing. My heart rate was the key thing and the time would be what it was. My first mini-split is after 2.17 miles at the end of Mugdock Woods where the route joins the road for 50 yards. My plan said 21mins and I was 22:02 so I was happy that I had started comfortably. My average HR for the section was 123 so I had been slightly cautious but that is no bad thing. The field around me was spreading out now and there was plenty of room to run, overtake or be overtaken. As I went past Carbeth Cottages I went past a guy in a blue checked kilt. He was wearing the jacket as well and I commented that he would be very warm in that! The next time I saw after Balmaha he had the top off! There were a few times that I had to slow down to keep my HR down to 135. The temptation is to just go with the pace and allow the HR to go higher but I’ve found from past experience that if I do that I will pay for it later so I stuck with my plan even if it meant letting people run ahead. I went through my next two mini-splits right on target so things were looking good. It was great to see Ian and Sandra Beattie marshalling at the road crossing at Beech Tree Inn. I love the fact that the Race Director of the West Highland Way race is willing to be a marshal on a road crossing for another race. 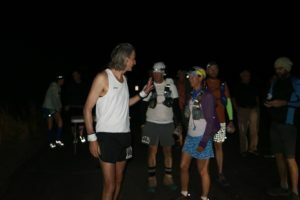 It tells you a lot about the support and togetherness of ultra running. As I had been running for over an hour I decided to eat my fruit bread with peanut butter and jam sandwich. I was also regularly sipping my Tailwind drink. I was slowly catching a number of runners ahead and over the next few miles there was a fair bit of passing and being passed as different runners ran or walked the hills. I chatted to a few folk over the final miles to Drymen. Fellow runners thanked me for my blog or the podcasts which is always an encouragement to know people find them helpful. I came into Drymen feeling very positive that I had paced it just as I wanted. I smiled to myself when I saw my time of 1:53:53 as my plan had 1:53. If I could keep that right to the end I would be very happy! I went straight through the checkpoint as I had enough water to get me to Balmaha. I remember when I ran the race in 2013 that I had pushed this section a little too hard so I was keen to keep my HR around 135. Again there were a number of times when I wanted to go a little faster but I held back and kept my HR down. I realised again that it does take a lot of discipline to run this way. I know it doesn’t suit everyone and some would argue that it is not the best tactic but I feel it really helps me to have an enjoyable race rather than having to hang on at the end because I’ve overcooked it early on. I reached my next mini-split 13 seconds over my plan so all was good. I’ve not been on this section for a few years and I was interested to see that the new path is now fully bedded in. When it was first laid it was quite muddy and tacky but now it is really good to run on. The weather was prefect for running. Cool without being cold and hardly any wind. I wore a long sleeved top which was just right. The only thing I changed was to roll up my sleeves sometimes! I ate another couple of slices of my fruit bread as I approached Conic Hill. The bridge at the bottom on Conic Hill was my next mini-split. I pushed up the stairs at the start of the ascent and when I glanced at my HR I saw it very quickly had gone over 140 so I had to ease off again. I tend to climb well and often catch others on the way up and I had to decide whether to push a bit harder or stick to the plan. I know from experience that if my HR is too high at this stage I will pay for it later so I eased off, brought my HR down and settled into a steady pace which wasn’t going to take too much out of me. Soon enough the top was in sight. There were a number of friends out supporting on the hill. Firstly Scott and Antonia handing out jelly sweets and encouragement. Then Graeme and Josh taking the official photos for the race. Then Graham and Katie cheering on all the runners as we started to head down to Balmaha. I took some photos and video clips of the views before putting my camera away for the descent. My quads were feeling good but I wanted to make sure I took it steady on the way down. My right ankle has been a little sore after long runs so I didn’t want to do anything that may cause further problems. As I reached the woods for the final descent I took out my Tailwind so when I reached the checkpoint they could quickly fill my bottle and I’d be away. Martin took a photo just as I was putting my rucksack back on. Balmaha checkpoint was buzzing with marshals and spectators. It was great to see Davie and Sharon amongst others. Gavin very efficiently filled my water bottle. I took my drop back and I was away again. I had sweet mashed potato but decided to eat it on the next hill rather than in the checkpoint. 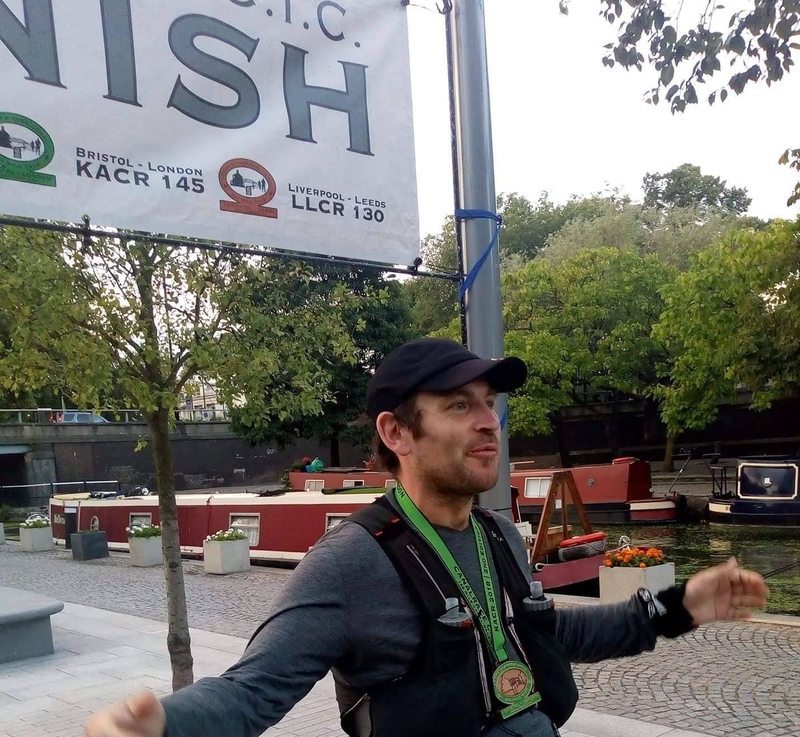 When I looked at the time I realised I had ‘lost’ about 7 mins to my plan but I wasn’t unhappy as I was feeling really good and felt I was running within myself and had plenty left for the rest of the journey. As I climbed up the steps to the view point where I married Ryan and Becki I ate my sweet mashed potato. It tasted good and went down easily. Overall I did well with my food plan eating all the main items on my plan but I didn’t eat any the extra bits I had like Chia bars etc. I caught up with one or two runners over the next mile or so. As I ran along the ‘beach’ section I could see a female runner ahead which I thought might be Helen. I caught her on the short road section after the beach and we ran for the next few minutes together. Helen felt she had maybe started a little too quick but seemed to be enjoying her run. After a mile or so she encouraged me to push on which I did. There was a runner just behind me over the next few minutes and just after we went over one of the bridges I heard a thump as he fell to the ground. I turned and with another runner we helped him up. He was a little shaken but said he was okay and told us to keep running. I hope he was okay and finished. I was still concentrating on my HR but I found it hard to slow down a couple of times. I ‘lost’ another 5 mins over the next 5 miles to my plan and I was tempted to push on and not look my HR but I had committed myself to my plan so reigned it in and kept to my plan. I find one of the hard things is when I catch someone, get past then have to ease off because my HR is too high. This means that I get overtaken again!! This can happen a few times but I tried to keep the bigger picture in mind and that it to be able to run consistently right to the end. Stephen must have been one of runners who went past me again on this section as he arrived before me to Rowardennan. Sallochy is my next mini-split and there were some children giving out water. I recognised one boy from one of the schools I work in. I think he was excited to see me and actually know one of the hundreds of runners going through. On the first hill after Sallochy I saw Stan ahead. He was doing a kit check making sure everyone had the two compulsory items (Mobile Phone and emergency blanket). Unfortunately mine were at the very bottom of my ruck sack and took a minute or so to get out! I think it’s a great idea to do a kit check though as safety at ultras is so important. We are not asked to carry much in this race but sadly Stan said he had had to disqualify two runners for not having the items. I ran a little harder over the last mile or two to Rowardennan and my HR did average 138 for the final mini-section to the checkpoint. I felt the race was really starting now! I was 15mins behind my sub 10:15 plan but feeling good and happy that I had kept to my plan. I knew from now on it would be what it would be and I would do my best to keep an even effort to the finish. I had decided that after Rowardennan I wouldn’t look at my HR much, because from past runs, as my legs tire it is actually hard to get the HR up to 135! Looking at my splits after the race my average HR for the second half of the race was around 131 so not too bad! I had a small tub of baked beans to eat but I held on to them until I reached the first longer climb past the Youth Hostel and I ate them then. I was slowly catching runners ahead and one or two caught me. One of the runners who caught me was Stephen Morrison who is a good friend of Ryan & Becki. I was surprised to see Stephen as he is normally a fair bit faster. He explained that he had run with a friend until Rowardennan but was now pushing on. The Fling this year used the higher path rather than the newer lower one. As we made our way up I did wonder whether this might be the last time I run on this path as I think it will be closed in the future for logging. I was basically walking all the up hills and running every else. I find it interesting that others were running more of the up hill but I tended to catch them as they took longer to recover after the hill. There were a few female runners around me at this point. I was chatting to one girl who is fell runner and this was her longest race. She was very strong on the hills as you would expect from a hill runner. Stephen had said that Becki was running this leg for her relay team so I wondered whether she would catch me. From Balmaha onwards there had been a number of relay runners going past. Fortunately they had a white number with black border on their back so you knew they were a relay runner. In fact when a runner caught me I always hoped they were a relay runner rather than a fellow full distance runner!! At some point along this section I caught Andrew McK. I taught Andrew’s two daughters swimming a few years ago so it was good to see him again. It was the best timing though as he had stopped on the side of the path with cramp. He said he was okay and I saw from the results he finished so that was good! When I reached the start of the single track which was my next mini-split I had ‘lost’ another 7 mins so was now 22mins behind my plan. I didn’t panic as I knew I was moving as well I could and there was always the hope I would be faster over the final section from Beinglas Farm. I try really hard to stay in the present and not to think about too much about the end. That is why I like my mini-splits. So I focused on reaching Inversnaid and not thinking any further ahead. I slowly caught up with a line of runners and was surprised to see my friend Mike T ahead. Mike recently retired and I know has been running well. As we approached Inversnaid I finished off my Tailwind and emptied the next sachet into my bottle ready to be filled. I came into the checkpoint feeling tired but still positive about how things were going. I decided to stop a little longer and eat my Greek Style youghat here. 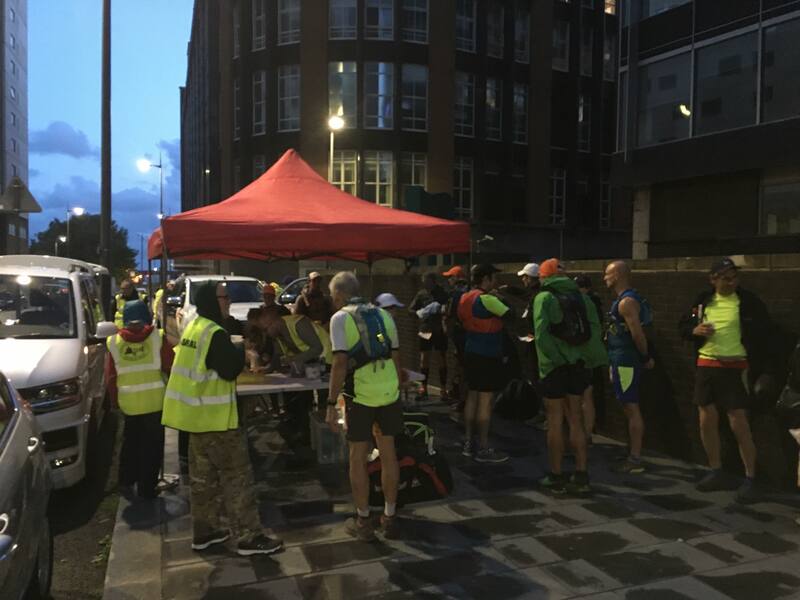 John and Helen M were on the checkpoint doing a great job of helping all the runners get through as quickly and efficiently as possible. Katrina and I have marshalled at Inversnaid. I think it is one of best places to marshal as no support teams come so you can have a big influence on helping the runners. It felt quite cold at the checkpoint and there was a little rain shower so I didn’t stay too long. This next section is always going to be tough but I’ve learnt to love it knowing that once you reach the top of the loch the hardest part of the route is over. I needed a wee so I hid behind a rock. While I was on my comfort break about 5-6 runners went past. Once back on the route I settled into a rhythm and tried to keep moving as best I could. A few times I was conscious of runners behind me so I let them through. I was concerned that I was going backwards in the field a bit and I definitely felt I was going through a tougher time. Thankfully I was able to get going again and soon enough the runners who had gone past me were not too far ahead and I caught up with them. The girl I was running with made her way past the line of 6-7 runners but I was quite happy to stay at the back of the line as I knew the small river and open grassy area wasn’t too far away. Mike T was near the front of the group. Once we did reach the open area the faster ones who were held up were away. Mike seemed to be struggling a bit as I went past but it was good to see him at the finish. I was conscious of my ankle so was a little more cautious than normal on the descents. I didn’t want to do anything silly! I took some a photo of Dune Bothy and made my way to Dario’s post. There is another smaller post before Dario’s that I use as my mini-split. From Inversnaid to the post I had ‘lost’ another 7mins so was now 32mins behind my sub 10:15 plan. I was a little concerned but there wasn’t much I could do about it! I was running as well as I could! As we reached Dario’s post a runner kindly asked me whether I would like a photo which I gladly said yes. Dario was a good friend and I always take time to remember him as I go past this spot. He would be thrilled to see how many people are now running on the West Highland Way. As Race Director for the whw for 10 years he had it accessible for many people including me. There is a big physiological boost in getting to Beinglas Farm as you know you are on the final leg to the finish. I tried not to think too far ahead but it is hard not to! It was great to arrive at the checkpoint. As it is a relay handover there were lots of relay runners and supporters all giving lot of encouragement. My water bottle was refilled and I took my drop bag. I also drank a couple of cups of coke before heading off. My good friend Ryan was waiting for Becki to come in to run the final leg for his relay team. Ryan walked out with me as I ate my fruit pot. He didn’t come too far as Becki was due in any minute. I knew I’d be seeing Ryan shortly as he ran past! I left the checkpoint with Pete. Like Stephen I had seen a lot of Pete during the day. I didn’t know his name then but he had tattoos on each calf so he became tattoo man. We had passed and repassed each other a number of times. For this final section I like to break it down into four mini-sections. Roughly it is 3 miles to Derrydarroch, 3 miles to the big gate, 3.5 miles to Auchtertyre and 2.5 miles to Tyndrum. I was 35 mins down on my plan so sub 10:45 became my ‘new’ plan! I was feeling pretty good considering I’d been running for over 8hrs and I hoped because of sensible start I should be able to keep going. I focused again on the next 3 miles to Derrydarroch. I could see how I was getting on to there and that would give me an idea of how I was doing. I was running all the flats and downhills and walking as hard as I could on the up hills. There were a few people supporting at Derrydarroch which I was a little surprised at as I thought supporters weren’t to go there. Anyway they cheered me past. I was 55 secs over my original plan so that was encouraging. I caught up with Stephen again after Derrydarroch and we ran together for a while. Once we had gone through the two tunnels making sure we didn’t bang our heads we had slightly different tactics. Stephen was running more of the up hills whereas I was keeping to my walk the hills strategy. The path around cow poo alley was as dry as I’ve ever seen it so that was a bonus. A few more relay runners went past me including Ryan who looked very focused on getting the job done. I know he was targeting 1:11 which is the best time for a relay runner for that section! As I approached the big gate I could see lots of flags and people so I made sure I was running the final bit to the gate! Graham and Katy were there so it was good to get a high five. Pete & Shelley were also there so thanks to Shelley for the photo. I was actually 1 min ahead of my original plan so that gave me a boost. I had now 6miles to go and 1 hr 18 mins to get under 10:45. Definitely doable! I like the roller coaster hills in the forest but no matter how many times I’ve run it I always lose count of how many hills there are. I know when the final one comes but it often takes longer to come than I’d like. Half way through the forest I caught up with Mark L. I was really surprised to see him as he is normally well ahead of me. I think he was having a tough time and having to battle through. We had a quick chat before I pushed on. Eventually the final uphill arrived and the longer downhill to the road. My quads were feeling good and I felt I was running strongly. Once over the road and through the field I caught Stephen again. We ran past St Fillan’s church and towards Auchtertyre together. I did joke that we were going to end up having a sprint finish down the red carpet! I reached Auchtertyre which is my final mini-split. I was just a minute slower than my original plan! I had given myself 38mins to run the final 2.37 miles but I knew I was going to do it faster than that. I had 32 mins to beat 10:45. I caught a runner who had his daughter with him. As I went past she was encouraging him to run but he was saying I can’t run the uphills anymore! I know the feeling. I ran as hard as I could for those final couple of miles. I could see a runner not too far ahead but he wasn’t quite in reach. I ticked off the final markers until I reached the path by the river. I could see a relay runner not far ahead and I went past her just before the piper. It was a great feeling to enter the By the Way campsite and hit the red carpet. There were plenty of people cheering me home which was very special. I gave a few high fives to the children cheering. I finished 179th in a time of 10:38:50 (19th M50) which I was happy with. I ran 10:36:10 for my first Highland Fling in 2007 so I’ve only lost 2 mins in 10 years!! I won’t take into account my 9:44:41 in 2008!! It was great to see Katrina on the finish. Over the next few hours I enjoyed a lovely shower, some excellent food, an amazing massage and chatted to friends about their runs. I was looking forward to seeing how Lesley and Annette got on in particular. Lesley finished in 12:32:51 for a pb of over an hour and was very pleased with herself and rightly so! I saw Annette finishing in 14:03:37. She looked very emotional as she crossed the line! Finally a massive thank you to John and Noanie and their team of around 245 volunteers. What an amazing group of people who gave up their weekend to support the race. Thank you one and all. So my focus switches to the West Highland Way Race. This race has given me a more realistic goal to aim for but I’ll share more about that later.